The path to the 14th hole at Praia D’El Rey is made of white sand and seashells. The Atlantic Ocean roars to the left as the trail meanders between low dunes. My shoes crunched with every step and yet, marching towards me were three barefoot surfers, heading for the beach. It was all somewhat surreal. Here were two sports at very different ends of the spectrum in terms of skillset, energy — and fashion — sharing the same path. A sunset view of the 13th at Praia d’El Rey. The Atlantic Ocean roars to the left as the trail meanders between low dunes. Cascais, Sintra and, an hour north, the Centro region all offer spectacular golf. One of the surfers whistled and a chocolate Labrador appeared through the dunes, already wet and panting. As the surfers disappeared from view, I teed up on the par three 14th, enjoying a beautiful stretch of holes at one of Portugal’s top resorts, and realised that I’d never have the style to be a surfer. It was the start of a 10-day trip to areas of Portugal where golf shines brightly but rarely gets the credit it deserves. Cascais, Sintra and, an hour north, the Centro region where I was at that moment, all offer spectacular golf. Yet Irish golfers rarely head this way to explore courses that hug the coast, roll through forest and mountain, using umbrella pines to dramatic effect. This is in no way a slight against the Algarve… but let’s be honest and say that Portugal’s southern golfing haven has had it very easy in recent times. It has an enviable reputation for sunshine and choice, but the rest of Portugal should not be ignored. Over 10 days, I experienced stunning courses that comfortably rivalled the Algarve. Praia D’El Rey wasn’t hanging about in proving the point. I had gone from umbrella pines and sandy wastelands to the glory of seaside thrills before I encountered those surfers. The course is part of the five-star Marriott Resort at Praia D’El Rey, which sits on Portugal’s Silver Coast, overlooking an endless beach stretching from Peniche to Foz do Arelho. The hotel is spacious, pared-back luxury and the elegance was clear to see in a hotel that was enjoying a quiet period before the Christmas rush. The guest list appeared to include just myself and the U16 German Girls golf team. 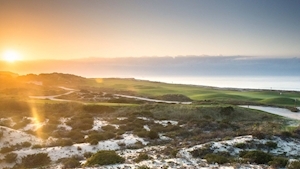 The West Cliffs course to the north of Praia d’El Rey, between the Atlantic and Obidos Lagoon. Golfers will be spoilt here, not just because of the hotel and its pools, restaurants and bars, and its location, but because the resort has a second course which opened in 2016. West Cliffs lies to the north of Praia d’El Rey, between the Atlantic and Obidos Lagoon. The course was designed by Cynthia Dye and has been making headlines since it opened, winning global awards that have put it firmly among the top of Europe’s best courses. It is vast and plays through and over rumbling dunes. It is not a true links: it is an altogether different beast with lush fairways, dynamic greens and endless, explosive bunkering. The rough is a sandy wasteland populated by shrubs, wild grasses and lost balls… lose one and chances are you’ll find a handful of replacements. It’s a joy to play, but it is by no means easy. Choose your tee with great care to maximise enjoyment, or your post-round visit to an exceptional clubhouse will be spent counting balls lost rather than shots taken. The nearby village of Obidos is one of cobbled streets, medieval walls and wedding presents — in 1282 King Dinis offered the village as a gift to his new Queen Isabel on their marriage — and it carries a rich place in Portuguese history. Royal Obidos Golf Club has its own slice of history, being the last course to be designed by Seve Ballesteros. This beautifully shaped course opened in 2012, and it has a captivating style and flow that makes it utterly different to West Cliffs, right next door. It is a toss-up as to whether you prefer Praia d’El Rey, West Cliffs or Royal Obidos, but you will have a lot of fun finding out. The 18-hole Bom Sucesso Golf Club is also close by, making the Centro Region a strong golfing destination. Lisbon Airport is well served by Aer Lingus, and the courses are only about an hour’s drive away. Farther south, the wonderfully picturesque town of Sintra and the explosive mountains that rise around it are among Portugal’s most popular tourist destinations. This is home to famous castles and the colourful National Palace, all lost amidst the forest and endlessly winding roads. These hills are also home to one of the plushest five-star resorts you will ever experience. Penha Longa oozes lavish sophistication from the moment you arrive and it is the friendliest place you could imagine. It is wrapped around a 14th-century monastery and stretches across a landscape drenched in forest, with those hills forever rising above you. The view down the first hole at the five-star Penha Longa resort in Sintra. There are 27 holes here, designed by Robert Trent Jones Jr, and the championship course curves beautifully through the hills and trees with such strong variety that every hole entertains. The 3rd, 5th, 13th, and the sensational final three holes use the greatest elevation changes and make Penha Longa a thriller. If you are lucky enough to have a room at the back of the hotel you will look over the monastery, gardens and down the 1st hole as it curls out of sight into the trees. It is a perfect appetiser. And speaking of appetite, Penha Longa boasts a startling eight restaurants, two of which carry Michelin stars. If you’re a foodie you’ll be in heaven as your choices stretch from Indian, Italian, and Asian, to classic Portuguese and tapas. There is also an exceptional spa (the Zen garden is out of this world) and a leisure centre equipped with the latest equipment — golf is only one of the resort’s many activities. Penha Longa is at the top end of the five-star scale and rates reflect that, but with the Unlimited Golf package of €270 per night, per room, with breakfast included, Penha Longa promises something special. Several courses are within easy reach — Estoril, Lisbon Sports Club, Belas Clube de Campo — and given what else is found in these Sintra hills, this is a perfect base from which to explore. The final stop of my tour took me to the charming fishing town of Cascais. This is a popular tourist destination with its beaches and history, restaurants and architecture, and its easy access to Lisbon (the one-hour train journey along the coast is captivating). Surfers and families will find perfect beaches all along the coastline and a beachfront promenade stretches almost two miles to Estoril. tight drive down the 17th at Penha Longa on the Lisbon Coast. I stayed at the Quinta da Marinha on the outskirts of town. The hotel is perfectly located, overlooking the resort’s golf course which stretches out to the sea, through undulating terrain and umbrella pines. It is big and expansive, with beautifully shaped bunkering a constant visual feast. And, with its five par-fives and six par- threes, there’s an unexpected dimension to the course. The par-five 18th is a strong finale as it weaves between lakes and finishes next to the hotel. From here you can walk straight through to the Trent Jones Bar… a simple nod to the design pedigree of this resort’s 18 holes. Only a few minutes away is another of the highly revered Portuguese and European golf courses. Oitavos Dunes is a links course that may be far from the sea but it has plenty of links credentials… if not the feisty dunes that Irish golfers are used to. It is part of the Sintra Cascais National Park which gives it some additional environmental credibility. Opened in 2001, this feels settled and natural and is all the better for it, using wonderfully fluid, spacious terrain. Back-to-back par-fives on the front nine are matched by back-to-back par-threes on the inward nine. It is an intriguing adventure and, like West Cliffs, it is very different to what you might expect. Oitavos Dunes is constantly ranked among Portugal’s top five courses and West Cliffs has already risen to the top of that ranking. Throw in Praia d’El Rey, Penha Longa and Royal Obidos and you have five courses in this country’s top 15. That, surely, can rival what’s on offer in the Algarve and makes the Lisbon Golf Coast utterly irresistible.